Having trouble figuring out what to wear for Halloween? What could be scarier than this? When I worked as the classical music director for a college radio station during the later 1980s and 1990s I marveled at the way the students who maintained the library put recordings into categories. There was jazz, cool jazz, bebop, new age, folk, hard bop, blues, hip-hop, soul, rock, world, and a whole slew of modifiers that divided each "genre" into specific sub-genres. I believe doing it gave the students who assigned the recordings their labels a sense of accomplishment and importance. Then there was "classical," which was divided into two categories: general, and "short-takes." As far as most of the students were concerned (except for the ones who I worked with) "classical" was just one thing. Boring is one word that comes to mind. I never really let it bother me, since most the students I worked with found out that their preconceptions were wrong. After spending a few months working on the "classical" music programs, some of them even became knowledgeable, and some found music that they really liked in the vast sea of the "classical" section. My music appreciation students begin every semester with similar preconceptions about this music we insist on referring to as "classical." Most of them come into the class knowing country music and whatever popular music happens to be saturating the commercial airwaves at the time. A few of them are eclectic and have developed specialized tastes, but they still initially see the vast world of all that is "not classical" as having far greater variety than the music they will be learning about in class. I take great pleasure in breaking them of this preconception, and always get a mid-term "lift" when I read the papers they write about their experiences listening to the radio (we have two NPR stations in our area) and going to concerts. 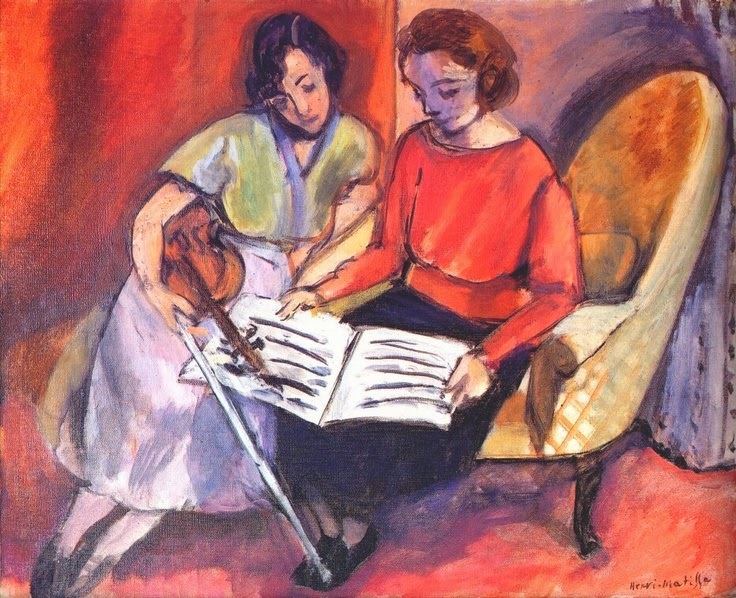 Nearly every student is surprised at the variety of music that he or she hears, and nearly every student is pleased that s/he can identify music from the different periods we have studied (and at mid-term we haven't even gone beyond the Viennese Classical Period--the only application of the word "classical" I feel comfortable with). Semester after semester the students who stay in the class (i.e. the students who do the assignments and come to class) let me know how surprised they are to find that they actually enjoy listening to "classical" music. There are probably more excellent "classical" recordings being made now than ever before. More people have the tools and practical knowledge to make a recording sound professional than ever before, and, with a little bit of money, people can easily create their own recording labels and arrange for their own marketing and distribution. "Classical" recordings are still a small sliver of the genre-rich recording market, and though there are a vast number of "stars," there are only a handful of living "classical" musicians who are recognized by the general public. Those musicians are people who have been well marketed, and many of the most prominent "classical" stars are simply not the best musicians. Some of them are downright lousy. High-profile people in the musical blogosphere talk about "classical music's problems." They have been talking about them for years. Some people find fault with the way organizations that perform "classical music" promote their concerts and reach out to audiences. Others find fault with the kind of programming that orchestras offer. Lately people take issue with the way managers of "classical" organizations treat the musicians that they employ. These are not "classical music's" problems. "Classical music" is not an institution. "Classical music" is not an organization. "Classical music" is not dying, because "it" is not a living organism. Musicians simply go on with their work, whether it is something they can make a living from or not. Some play beautifully, and some play well. Some don't play so well. Composers write music because they write music. Some of it is great, some is good, and some is not. A small amount of the music that people compose gets recorded, and relatively little of it gets performed, but people still do play newly-written music for pleasure. People play older music for pleasure too. They take lessons, play with their friends, play concerts for audiences large and small, and they practice. What we do is really not that different from what people have always done. The problems I encounter while practicing a piece of Mozart are the same problems that countless other musicians have encountered during the 19th century and the 20th, and in all parts of the world. The joys that I get from getting a passage to sound good through analysis and repetition are the same joys that countless other musicians have enjoyed. The intimate exchanges that happen during concerts are the same kinds of intimate exchanges that have always happened, regardless of the size of the hall, the size of the audience, or the size of the city. "Classical music" doesn't have a problem; just a lousy name that reduces the size and scope of centuries of music from all over the world so that it can be safely tucked away from view and effectively marginalized. This interruption of the Haydn Piano Concerto is so very interesting . . .
Watch all the way through. What happens when the musicians resume is very special and quietly empowering. The title of this video "Haydn Killed by Cell Phone" is wrong. Absolutely wrong. It should read "Haydn Triumphs" because he does. The smile and gleam in the eye of the concertmaster says it all. I remember being in Boston during the 2004 World Series. During one of the games (that the Red Sox won) I was at a Boston Philharmonic concert at Jordan Hall with my brother (the program was Mahler 1 and Songs of a Wayfarer), and my father was playing a BSO concert across the street. I went backstage at intermission to see my old friends (I used to play piccolo in the Boston Philharmonic), and all the brass players were fixated on the game, which was playing silently on a television. Our concert was over first, so we went to Symphony Hall and hung out backstage until our father's concert was over. There was just as much excitement among the BSO brass as there was at Jordan Hall. The excitement on the street was extreme (Fenway Park is just down the street from Symphony Hall). At that point I understood something about Boston that I never understood before. I really enjoyed watching this video, so I'm sharing it here. I love the engraving on the BSO tuba player's instrument, and I love the spirit of the whole thing. I can no longer recognize a single face in the current BSO brass section, but now that I live in the midwest I actually recognize some of the St. Louis Symphony brass players (that bearded trombonist is hard not to miss). Go figure. Time marches on. I'm still rooting for the Red Sox. My friend Allison Brewster Franzetti, who coaches a group of chamber-music-playing adults at Rutgers in New Jersey, asked me if I had written anything for flute, oboe, and string trio. To my surprise, I hadn't. It's one of my favorite instrumental combinations, thanks to Johann Christian Bach. My new two-movement piece is now in the Petrucci Library, and if you want to hear it right now (before the recording uploads itself into the library), you can listen here. I found this on picture on Mike Brubaker's TempoSenzaTempo blog (it's well worth spending a lot of time there), and thought I'd open up the mystery here. 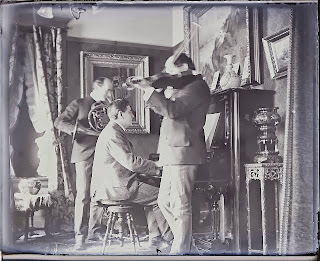 Perhaps someone reading might be able to identify one or more of the musicians (or the art on the walls). Here's his fascinating post about the photo. Yesterday Michael and I went to a Matisse exhibit at the Indianapolis Museum of Art. The paintings, prints, drawings, and sculptures exhibit came from the Baltimore Museum of Art's Cone Collection, which is the largest private collection of Matisse's work. It was but a sliver of his total output, but it was enough to get the gist of what made him "tick" as an artist. Like Picasso, Matisse had an extraordinary amount of pure technique. He could do anything, and he did everything constantly, working from the purely representational through all kinds of abstraction in search of what he wanted to say for that particular piece. There are, of course, many ways of saying the same thing. One might not be more successful than the other, but that doesn't matter. Presenting an image from one perspective may not be better than presenting it from another. Today I prefer the first image of this scene, but tomorrow I may prefer the second (I did see the first in the "flesh" yesterday). 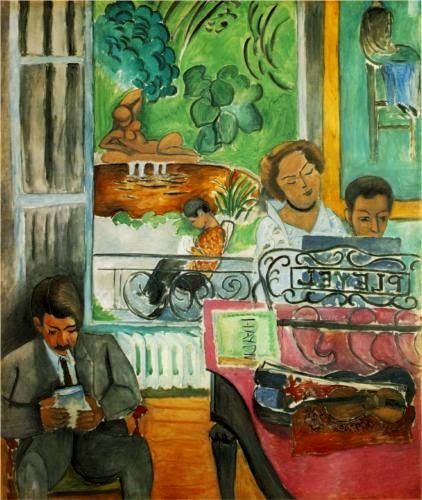 Maybe Matisse's attraction to sculpture had something to do with the inside-out nature of three-dimensional art: the sculpture is seen from many different angles, and the "composition" is supplied by the viewer. Neither of these piano-oriented paintings were in yesterday's exhibit, but I learned a great deal about looking at them from having seen the Matisse works in the exhibit that used the same scenes or the same objects. The Peters Haydn edition on the piano in the first image has special meaning for me, and so does the Pleyel Piano. I love the way these two paintings work together. One is lively and interactive, with a sense of everything belonging to everything else (including the otherwise-absorbed father of the child, and the person listening outside). 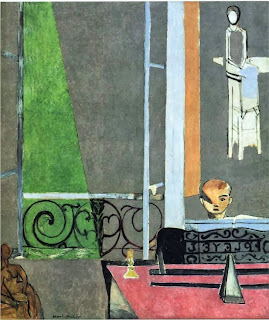 In the second image the boy is left alone, and a metronome sits on the piano. The light is the same, and the art on the wall has changed somewhat. Matisse changed the painting-within-the-painting too, giving the the woman the illusion of a face that is turned towards the boy. The father has been replaced with a female sculpture (which seems to be more attentive than the father), and the boy has a different face. The violin has vanished. Both are complete paintings that "say" very different things. 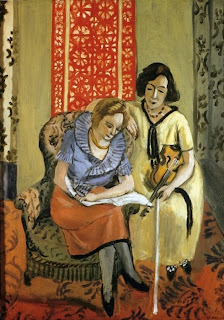 Something I learned from Mr. Matisse about writing music (or what I am learning from Mr. Matisse about writing music) is that everything is about composition. What goes where. Something complete and lively can be just as satisfying as something with fewer elements in it. The way to get those elements to work best together comes from a mixture of technique, intuition, trial, error, and taking many risks. In my quest to learn more about the piano, more about music, and more about Haydn, I have almost completed my first run through the 43 Haydn Piano Sonatas in my four-volume Peters Edition set. I usually limit myself to a movement or two, but today I played through the whole C major Sonata, Hoboken 16/50, because I found it so fascinating, so beautiful, and so much fun to play. My intuition tells me that Schubert probably loved this sonata too. My daily Haydn has become my refuge. I think that after tomorrow I'll just go back to volume one and start again. 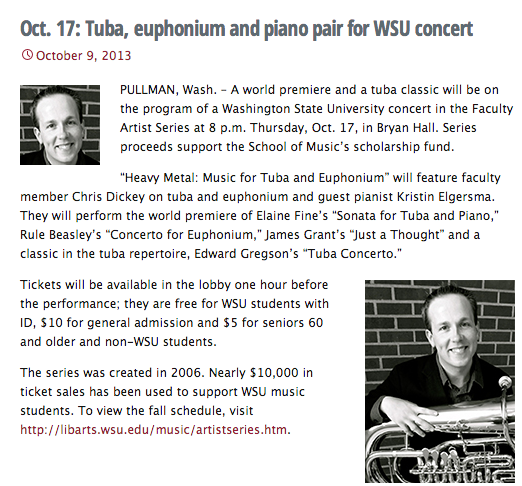 On Thursday, October 17th, Chris Dickey will be giving a faculty recital at Washington State University in Pullman, and he will be playing the world premiere of a Sonata for Tuba and Piano that I wrote for him. I have just discovered the wonderful piano playing of Nadia Reisenberg (1904-1983), and also just learned that she is the sister of Clara Rockmore, (1911-1998) the great Theremin virtuoso, and the mother of WQXR's "The Listening Room" host Robert Sherman. I put new strings on my viola last night (at long last), and this morning I had a little bit of time to break them in. Instead of doing the normal three-octave scales that use all four of the strings, I decided to break in one string at a time. 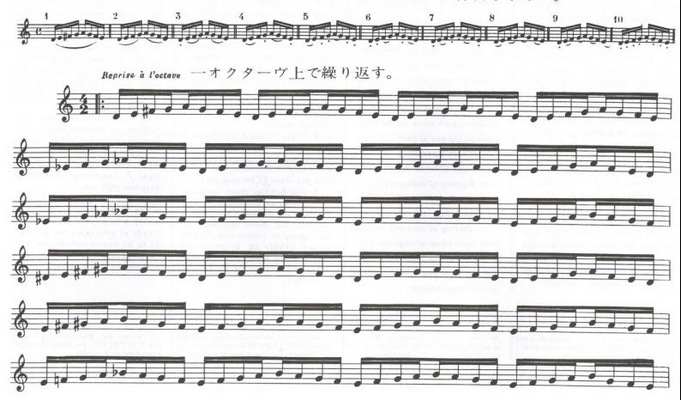 My mind, ear, and hand went to the Taffanel-Gaubert tetrachord exercise that I used to play on the flute every day for at least 15 years. Perhaps even 20. Like all students of Julius Baker (and all students of students of Julius Baker), I began every day with this. It was a kind of mindless meditation, where my fingers just "did" (I really had no idea what the names of the notes I was playing were, nor did I really stop to consider what the configuration of half and whole steps actually was), and my main concern was the feeling of my breathing and the uniform quality of the sound I was making. I began on the D string, and went all the way up, shifting with a different finger for each repetition, and changing the number of repetitions I would keep in one bow occasionally. I have always said that the flute was kind of like a violin (or viola) with one string, and the challenge of playing the flute is to use the air and the tongue to manipulate the natural color of the pitches in order to get variety. My breathing started to get very deep as soon as I began, and I noticed that I could use my deep breathing to allow tension to slip away from my left hand and arm as I played the notes that I could generate without thinking. There was time, due to the repetitions, to consider my bow changes, and there was time and "head space" to consider the quality and process of my shifting. The strange thing for me is the physical relaxation response that results from playing the same series of pitches on a different instrument. How I wish I could communicate with another flutist (one who studied seriously and played at professional level) who switched to violin or viola and plays at a professional level on his or her new instrument. I used to do these exercises on the alto flute too (which is pitched in G), so I imagine that all sorts of alto-flute-related sensations will come to mind when I do these exercises on that string, now that my D is broken in. 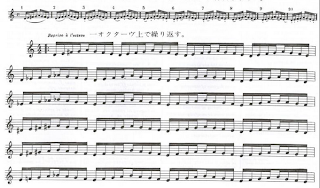 It's funny that doing this exercise on the A string doesn't bring flute sensations to mind for me, but doing this exercise from Marcel Moyse does. Well, it's time to go and break in my G string. Everybody reading this probably already knows the findings of the latest study about why music should be part of every child's education, particularly in districts where money is not flowing, but I thought I'd share this new article from the The Atlantic by Lori Miller Kase here anyway. I do not consider myself to be a "performer," but I find the concentration that I experience when playing concerts exhilarating. It makes me feel so truly alive and truly involved (even relaxed) when I am playing chamber music or orchestral music for a group of people who are listening. When the concert at hand is over, I want to have the experience again; but the only way I can "get" it is through playing music with people for people. I suppose it is kind of an addiction. Doesn't the word "performing" seem very much out of place? Catherine Tice, the Associate Publisher of the New York Review of Books began her expressive life as a violinist. 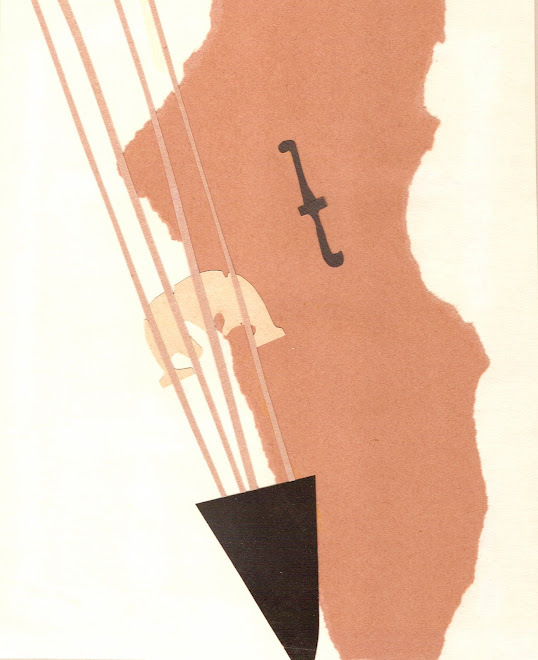 She writes about her relationship with her piano-playing father, and studying with Henryk Szeryng in this beautiful piece in Granta called, "A Brief History of a Musical Failure." I never had the makings of a prodigy. I had something else. Easy to say that I have this in common with thousands of others who took up, or were persuaded to take up, and eventually to put down, perhaps with some relief, a musical instrument. The ‘something else’ is what is sometimes called musicianship, which I am too inexpert to define, but at the time when it was just shy of full flower, I nearly gave myself over to the violin completely. I became musically exceptional for a child, but I lacked an essential psychological immunity to the dark side of self-criticism. When essential support was withdrawn by degrees it became increasingly difficult for me to do and be what I initially had no intention whatsoever of doing and being. Moreover, it simply isn’t enough to be good. This bit of memoir tears at my heartstrings. I imagine that Catherine Tice's life is full, and that she is busy with obligations, but reading this makes me want to put a fiddle into her hands and tell her that she can return to playing if she wants to. That she doesn't have to consider herself a musical failure simply because she didn't make it as a child prodigy or that she disappointed her father. Here's a personal note to Ms. Tice (that I'm putting here to share with others who share the same kind of disappointment): My father told me that I had that "something else" too. My older brother was a prodigy, and for that matter my father was as well. I was normal. I loved music. I loved the violin, but as a daughter I felt crushed when he referred to my time playing as a child as something of a failure, so I took up the flute, which was a way to continue in music. The flute was not the "voice" I wanted in music, but I figured it would do. It didn't. In my very early 30s I retaliated, and I started playing violin again. I built up technique from scratch (literally), gave myself permission to fail, both in private and in public, and have found a kind of musical fulfillment that keeps giving because it's all mine. Nobody "gave" it to me. Readers of this blog know about my devotion to Marjorie Kransberg-Talvi's blog Frantic: the Memoir. You might enjoy it too. And then you might consider that playing the violin is something that you can still have in your life. There is even a late starters orchestra you could play with in New York. My heart goes out to the concert going public in Minnesota - the real losers in this conflict. Not the administration or orchestra musicians. I don't really care about right or wrong; it doesn't matter...the orchestra doesn't exist for the benefit of the musicians or the board: they exist SOLELY for the people that attend concerts. Our government and tax laws allow organizations like this to collect tax-deductible donations, operate without paying taxes and run tax-free endowments in order to benefit the PUBLIC TRUST. In this case, that means the people - the American Public - that are supposed to benefit from an orchestra that is granted these privileges. The fact that these two warring groups - the board and players - cannot get along in the sandbox is the sideshow. The real problem? Music is huge in America, but classical music is dying; yet we still graduate 12 - 15,000 music performance majors from our colleges each year - at their annual juries they are made to play orchestral excerpts from pieces that they will never get to perform. Similarly, orchestras are not sustainable as playthings of the rich, as is their legacy, nor is their music of "dead white European men" a part of our culture. 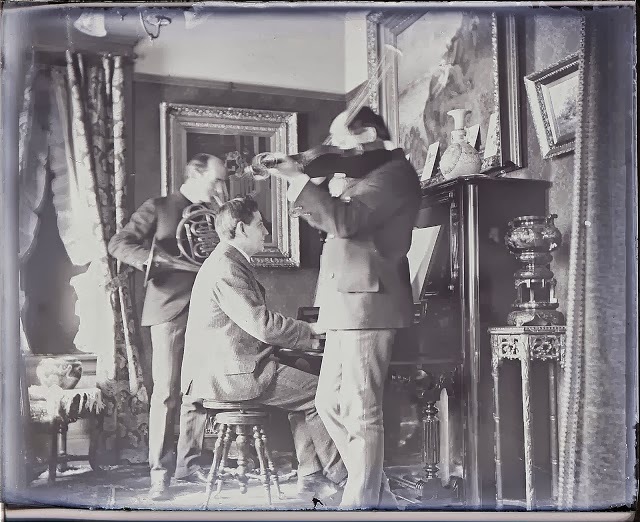 Labor and operating costs are TOO expensive for them to be run as a hobby by rich patrons, performing 200 year old music from Europe. Leonard Slatkin was quoted in Polyphonic as saying, "we know that our music only appeals to 2% of the concert going audience." Until you start addressing the 98% and stop the deluge of unemployable orchestra musicians, you'll continue to have debacles like Minnesota. And the loser will be the public and the 98% that don't know why we need orchestras in the first place. Maybe what we should make music school more like med school - difficult to get in and even harder to complete. The only hazing system similar to med school at Eastman was rushing for the insignificant Phi Mu Alpha fraternity. But seriously, my late father, by some miracle, was in the US Army as a drill sergeant and took and passed a medical aptitude test which sent him to Northwestern Medical School on a free ride courtesy of the US Government. He used to tell me that on his first day, all of the new students were in a big hall and they said, "take a look at the person on your right and left. One of you will be gone before the end of the year." The problem I observed at Eastman was that the hardest part of the school was just getting in! Once you were in, you could sail along and you'd still graduate, even if you did not fulfill the potential that got you there to begin with. I think some of the challenges of med school are some enormously difficult classes - labs where you have to cut people open, anatomy, etc. It is a difficult and not particularly fun curriculum. Maybe that is the problem with music school - it is too much fun! You get to continue to take private lessons like before, and get an absurd number of credit hours for it, even though non-majors take the same lessons and only get one third of the credit. You get to play in ensembles - see? There's that word: "play." Playtime. 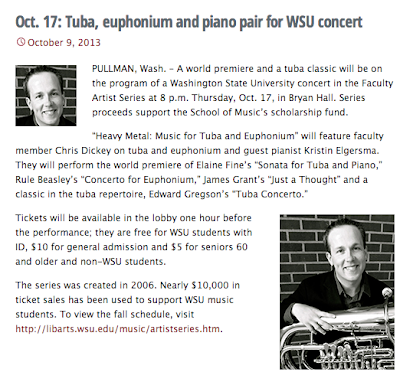 Music school is fun, and it shouldn't be. You should be made to do unpleasant things like they do in Med School to prepare future doctors for the challenges ahead. Wait! That's what I am proposing for the Drapkin Institute! Instead of cutting open bodies, my students will have to cut open business models and understand what make them tick. They're going to have to do a lot of things that not only go beyond their current understanding, but actually change the way they think. Things like learning that just because you practice hard and learn excerpts that you are not entitled to an orchestra job that earns you a living. Realizing that you need to find other ways to express your passion for music and finding out which of the other ways appeals to you. Gaining the business acumen to make this passion a reality, and when you fail you can't blame it on the executive director or the board of directors - YOU will be the chairman of the board with either only yourself to blame, or to cheer on with your own success. I've been blessed to have had two trajectories in my life that both started when I was in grade school - business and music. I wish to gawd that there was a program of the type that we are proposing. Instead I had to learn it the hard way: empirically and on the job. So instead, we are planning on sharing that through our nascent institute. We need not be defined by the narrow criteria for what constitutes success that was hammered into us in music school, that if you didn't get a job in a major orchestra you weren't successful. Indeed, I have been disgusted by the past ClarinetFests because they always deify industrial clarinet players that have no personality or individuality since they know that they wouldn't get hired if they did. We also have NO model for teaching leadership. In fact, we are hammered into learning followership: from the very first time we set foot in an ensemble, we are taught to follow. Who will be the leaders that arise from this constricted and outdated music school curriculum that is insidiously protected by NASM? No wonder why the orchestra world is a disaster: no individuality, no creative ideamaking, no leadership. Just a whole head of musicians recreating Nero fiddling obliviously as Rome burns and orchestras melt down like the Minnesota Orchestra. There are better ways - much better ways, and I intend to prove it. I'm pretty sure that Michael's savvy with business is something that flourishes on part of the family genome that I don't share, but that's one reason I find his particular talents so intriguing. Chutzpah he has always had, and success too. Perhaps with the way things are going in the music profession it might be a good idea to try his ideas and see if they work.